Imagine a wood-free bird feeder that actually looks like wood! Our EcoTough™ Classic won't crack, fade or rot and has a lifetime guarantee. The Classic has curved ends so you can see birds feeding on both sides at the same time. Perch drains allow seed to drop out of the feeder for ground-feeding birds to eat, and angled perches let empty seed hulls be blown away by the wind. The removable screen bottom is treated with EcoClean® Antimicrobial Protection, providing 24/7 product protection. A great starter feeder! 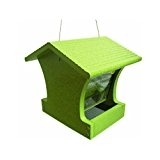 You can fill this with your favorite seed blend and the larger perching area will allow bigger birds to sit and enjoy the feast. Easy to fill, easy to clean and because it's made out of recycled materials it comes with a lifetime guarantee. 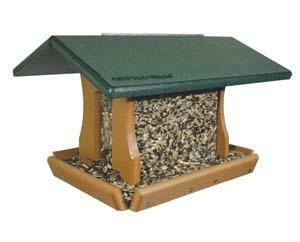 This feeder can be pole/post mounted or hung (we have hangers and would be happy to attach one for you). The removeable seed tray makes cleaning a breeze. Fill this with your favorite seed blend and enjoy the show! Lifetime Guarantee. 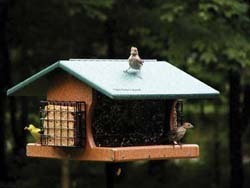 This feeder allows the birds to eat from all four (4) sides vs only having two-sided feeding. A favorite among customers and birds alike it will hold a decent amount of any seed blend so you don't have to fill quite so often. As with all of our EcoTough™ products, this comes with a lifetime guarantee. 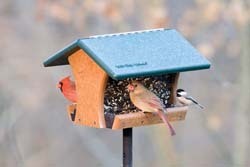 The EcoTough™ Ranchette is a fully functioning bird buffet that holds two (2) gallons of loose seed and two (2) suet cakes. With such a variety of food, you'll likely attract many different species such as nuthatches, chickadees, woodpeckers and more. 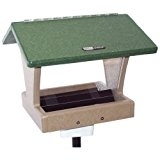 Also, the Ranchette features a removable screen tray (which is treated with EcoClean®- an Antimicrobial Product Protection that is working 24/7 to inhibit the growth of mold, fungus, bacteria, etc.) making it easy to clean. It is also backed with a lifetime guarantee.